Jesus birthday party helps teach your little ones the true meaning of Christmas. Each year we make a big deal out of it. Just as we make a big deal out of each child’s special day. This Christmas tradition will help remind adults and children that Jesus is the reason for the season. Read all 10 Days of Christmas Traditions and Ideas!Do you have a Jesus birthday party at your house? I love the red heart cake idea! Fun and creative. This is my first year to do this! Thanks for your party theme ideas. We are inviting friends and everyone is bringing a new, unwrapped gift to donate to a charitable group in our area! I’m so excited for my little one to throw a party for the Greatest Giver we know! 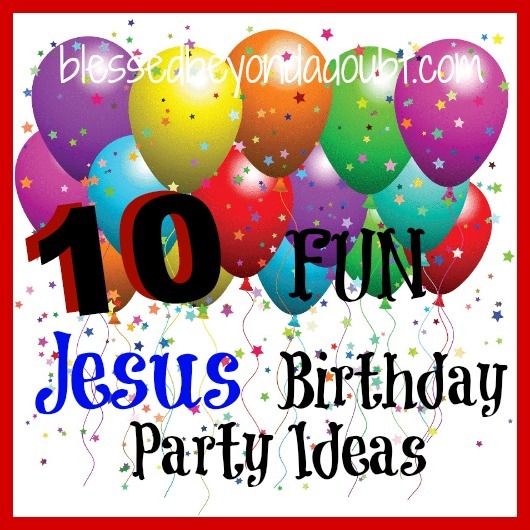 I love the idea of throwing a party for Jesus. I am working hard to keep Santa out of my house so as to not teach my children a lie. I want to make a big deal out of Jesus’ birth 🙂 Thank you for this! You are very welcome, Monica! My children are 16 and 13 and every year since they were little we do a Happy Birthday Balloon release. It is the very first thing we do on Christmas morning.